"Winter changed into Spring; Spring changed into Summer; Summer changed back into Winter; and Winter gave both Spring and Summer a miss and went straight into Autumn." Can you spot the honeybee visiting the cherry blossoms? Looking up through the canopy of the Kobus magnolia, along the exit drive. 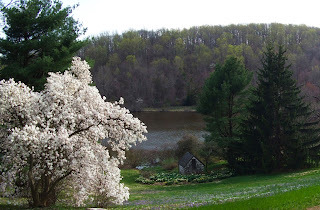 The weeping cherry to the west of the estate house is one of my favorites in the arboretum. The curtain of delicate white flowers (or, in summer, shining green leaves) makes you feel like you're in your own secret world. 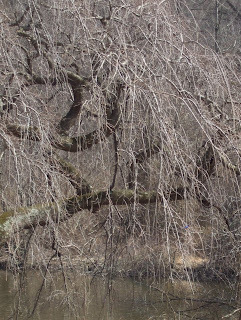 Welkinweir has six weeping cherry trees throughout the arboretum, besides several other, more upright forms. On your next visit, try to find them all! But you'll have to come soon if you want to take advantage of these beautiful blooms. Cherry tree blossoms don't last very long; in Japan, cherry or sakura blossoms were held to symbolize life's ephemeral nature, and festivals are held every year to celebrate and admire the trees. 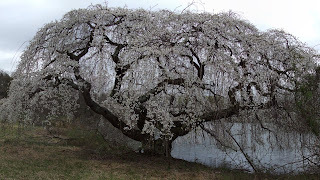 There are several cherry blossom festivals held here in the U.S.; while the most famous is the national festival held in Washington, D.C., Philadelphia also has its own festivities, presented by the Japan America Society of Greater Philadelphia. The Subaru Cherry Blossom Festival of Greater Philadelphia is happening right now, so be sure to check it out! There are several species of serviceberry tree, ranging in size from low, suckering shrubs to multi-stemmed small trees. Each of them have smooth, gray bark and clouds of delicate white flowers that light up our native woodlands in early spring. Those flowers then yield delicious blue-purple berries that taste like blueberries - if you can sample them before the birds do! 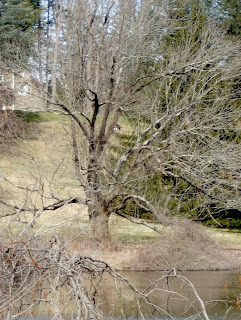 These trees are also called shadblow, because they would bloom or "blow" at the same time that shad would make their spawning runs up rivers in New England. to the dramatic, crimson-and-white flowers of the 'March 'Til Frost' Magnolia. In the early spring garden, we even have yellow-flowering magnolias, which will make their perfumed appearance in a few weeks. And let's not forget the flowering shrubs! Some of the early-flowering azaleas have bloomed, including the 'Cornell Pink' azalea, which combines with the Chinese Winterhazel shrubs to color the early spring garden in cheerful pastel shades. Close-up of the winterhazel's pendulous clusters of yellow flowers. The Japanese Pieris are one of my favorite flowering shrubs. Their lush clusters of bell-shaped flowers have a spicy-sweet fragrance that is intoxicating. The bumblebees agree with me; every pieris shrub in the arboretum is buzzing with them! The early-blooming perennials are also putting on a show at ground level. Along Azalea Lane, 'Multiplex' Double Flowered Bloodroot positively glows in the shade- this spring ephemeral is a cultivated relative of the wild bloodroot. ...and the 'Pagoda' trout lilies have also sprung up, seemingly overnight. The Virginia bluebells are just about ready to bloom as well. Welkinweir is welcoming spring with a colorful celebration of flowers; visit soon and enjoy the show! You never know what you’re going to see when you come to Welkinweir. The rich variety of habitat – from the woodlands and meadows which surround the ponds and stream, to the arboretum’s colorful gardens – is a magnet to scores of bird species, mammals like Castor (see here, and here), whitetail deer, and Fred the woodchuck, turtles, frogs, and salamanders; and insects like our honeybees and monarch butterflies. I saw the magical draw that our ponds in particular have last Thursday. It started right at the beginning of the day, with the sighting of a wood duck pair swimming alongside the more common Canada geese on the pond. You may have seen our two wood duck houses while walking along the smaller ponds in the woods near Welkinweir’s western edge. 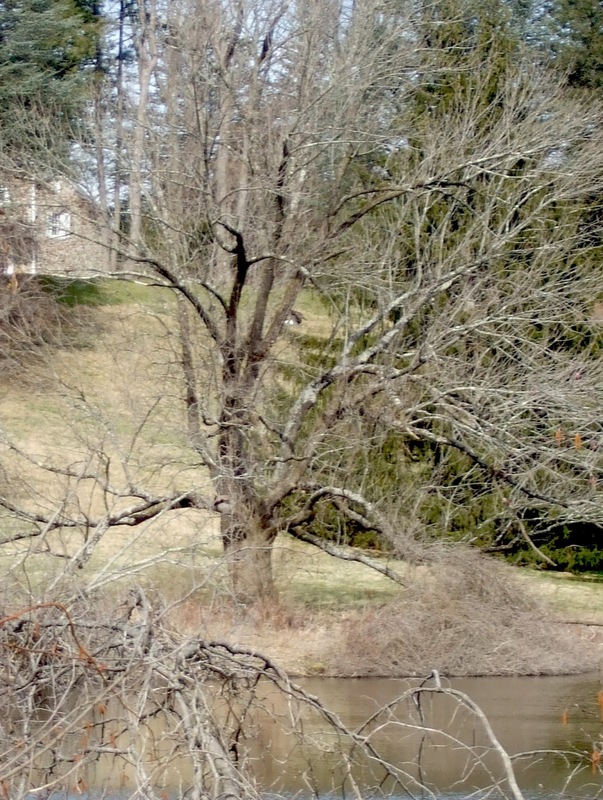 We haven’t seen evidence that the ducks use these houses, but it’s encouraging to see them using the ponds nevertheless! About a half hour later, I noticed the silhouette of a hawk-like bird in the sky over the pond. This raptor had long, gracefully arching wings that had large white patches on its undersides; as those wings lifted, they also revealed the bird’s almost completely-white belly and legs. 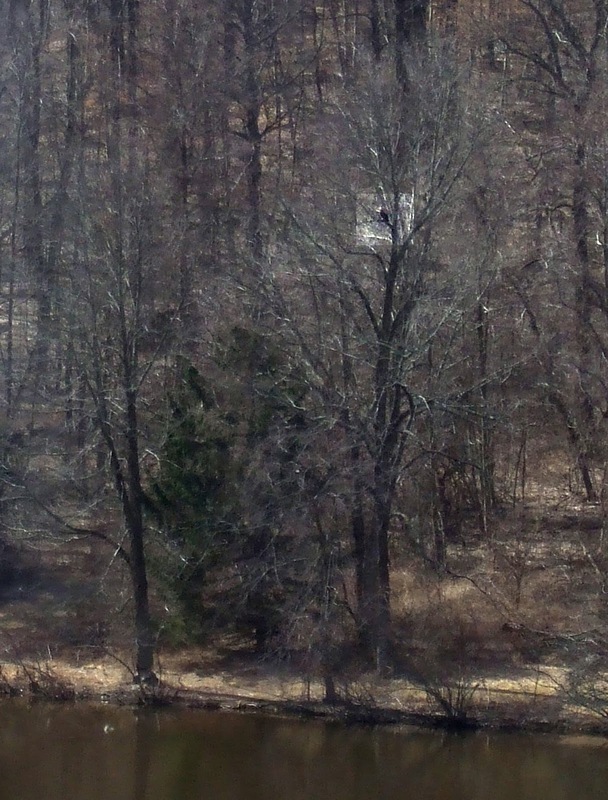 As you might have already guessed, it was an osprey. Pair of ospreys over Welkinweir's great pond. ...except that I didn't see just one! Barely five minutes later, I saw a pair of ospreys circling in the sky, crying to one another with their odd chirping calls. What were they talking about? 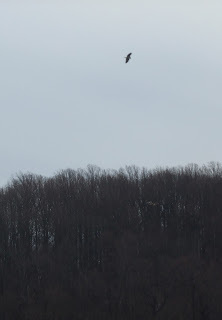 Perhaps it was the bald eagle that swooped over the pond soon afterwards! It was a big, chunky-bodied, brown bird with wide, plank-like wings and the characteristic white head, and as the eagle glided over the pond, one of the ospreys started to harass it by diving at it repeatedly. Apparently, the pond wasn't big enough for the three of them! With the bald eagle swooping around to defend itself, the two raptors looked like a pair of fighter jets in a dogfight. 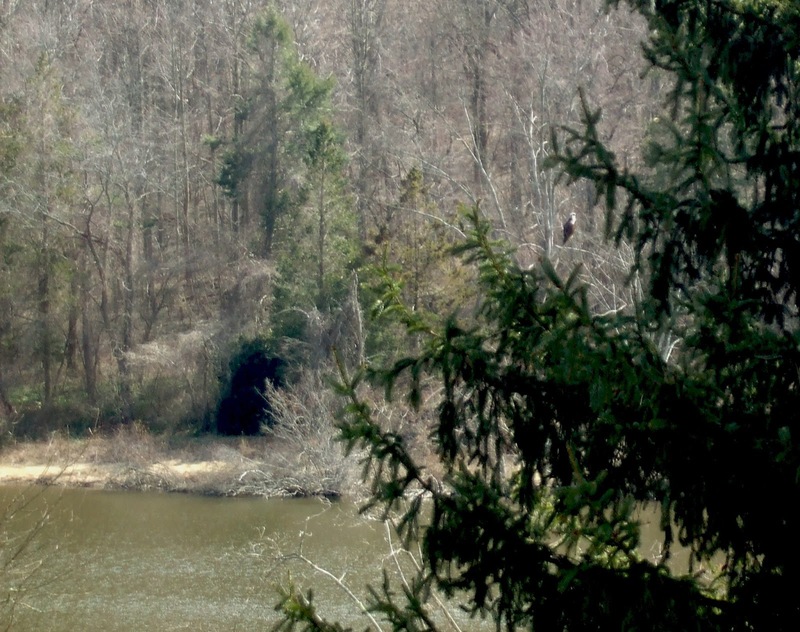 Bald eagles (Haliaeetus leucocephalus) have also been spotted along Welkinweir's ponds in the past, probably to hunt for fish like the ospreys. 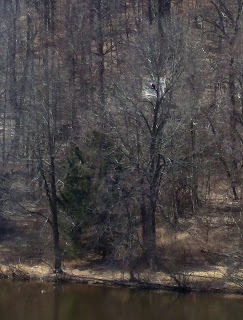 I attempted to get photos of all the action, although I'm afraid that the bald eagle is impossible to spot; try to look for its white head, below, where it perched in a tree along the south shore of the pond. 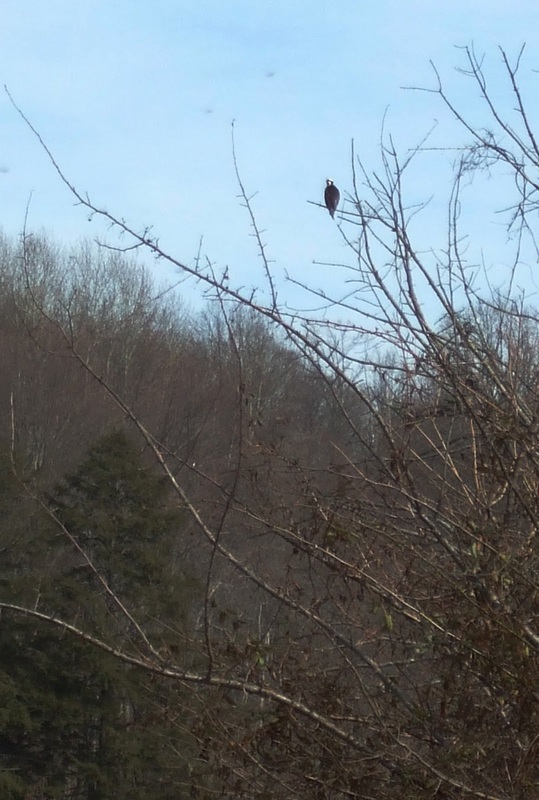 In the afternoon, a second possible bald eagle sighting inspired us to take a walk outside for a closer look. While we searched, the bluebirds and tree swallows were out and about, as they hunted for insects on the wing and guarded their nest boxes. 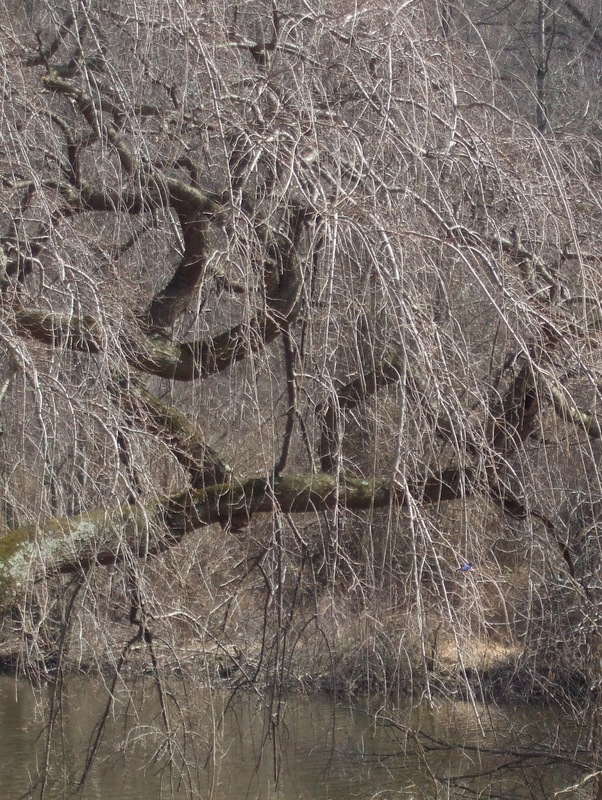 Male Eastern Bluebird (lower right corner) perched in one of Welkinweir's weeping cherry trees. 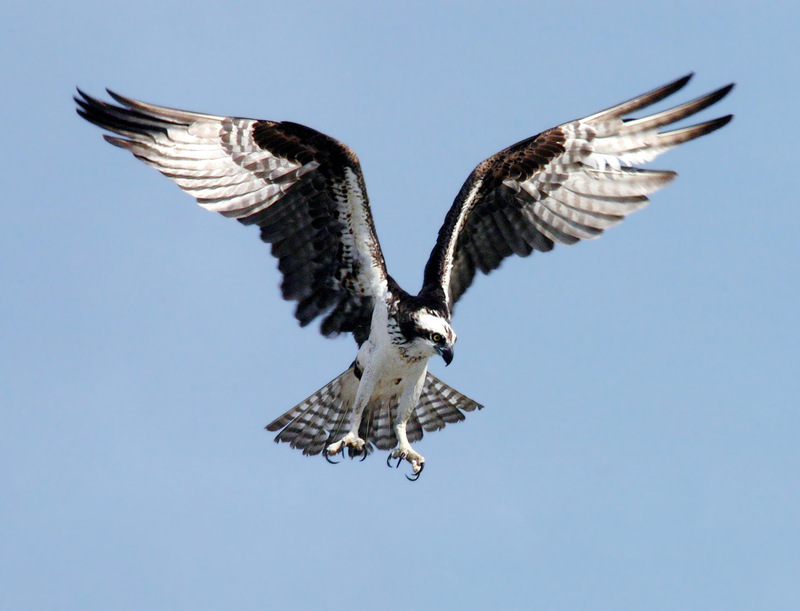 The osprey didn't appreciate my attempts to sneak up on it, but I managed to get a photo of it in flight. My day ended watching the aerial acrobatics of not one, not two, but three ospreys over the pond. Come visit Welkinweir's array of habitats, and see what wildlife you can find!